"The study of Goethe's life is a task that each generation must undertake anew." Thus writes Richard Friedenthal, author of this rich biography. 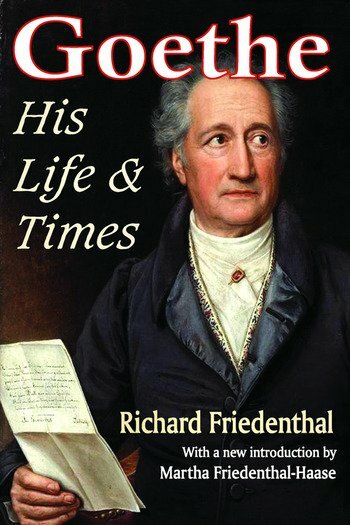 Spanning eight momentous decades of war, revolution, and social upheaval, Goethe's life reveals itself as one of conflict and dynamic development, of inner contradiction and unceasing creativity. As novelist, dramatist, and poet, Goethe produced epochal works of fiery romanticism, only later to dedicate himself to a classical ideal of purity and measure. His superb love lyrics immortalize a succession of ardent relationships; yet, in him too, was a strain of frigid egotism mingled with an Olympian detachment. The new introduction serves to place in perspective this outstanding work on the German master. He was capable of tirelessly exploring the external world as physiologist, geologist, and botanist. He was equally capable of plunging to the depths of profound subjective analysis. A minister of state, a model of distinguished probity, Goethe nonetheless lived a life of passionate seeking, eternally questioning official values. Nothing perhaps better sums up this vast complexity than his lifelong work, Faust, the supreme dramatization of man's quest on earth.